Sandy Berger The ventilator unit. 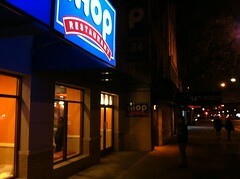 After neighbors complained for weeks about the “constant roar” and “inescapable blare” of IHOP’s new ventilator unit, the restaurant on East 14th Street was issued a noise violation on Monday, the Department of Environmental Protection said. The noise from the ventilator, which was installed after complaints about an unbearable smell of bacon, had caused neighbors to file at least four complaints with the DEP. On Monday, the restaurant was smacked with $560 in fines, said Ted Timbers, a spokesperson for the agency. But neighbors will have to keep complaining before they can get their peace and quiet: Mr. Timbers said the DEP can’t serve IHOP with an order to cease and desist until it has been issued three separate violations, and the Environmental Control Board won’t make a ruling about the first one until Sept. 10. 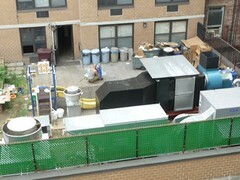 The smell of bacon on East 14th Street will soon be snuffed out. Following more complaints of a greasy odor emanating from IHOP, The Local contacted the owner of the eatery to get the latest on the installation of a ventilation unit to neutralize the smell. That will come as good news to neighbors of the restaurant who have complained since late last year about a nauseating smell that lingers around the clock. “The odors and noise are still a problem, and the so-called ‘roof’ still looks like a garbage dump,” wrote Sandy Berger, who recently posted flyers asking her neighbors to join an IHOP victims committee. “I had hoped that the owners would have corrected the problem by now, but right now I’m gagging on bacon fumes,” wrote another neighbor, Mary Beth Powers, to Community Board 6. If you happen to spot the installation of the most intriguing ventilator unit since that noisy air conditioner on East 13th Street, send us a photo.